What if young people had the tools, inspiration and mentoring they needed to uncover their voice, unstuck their writing, and become writers? I remembered what it was for me to discover writing as a teenager…how I would have loved more than anything to come to a place where that interest could have been nurtured. Surely I could create a tribe that would mirror the warmth, encouragement and spirit of my own writing group, Spoke. And that’s how Storymakers was born. The first workshop were held with on the grounds of a beautiful, historical house dedicated to art-making. For those girls, and for me, Storymakers was so impactful and successful I knew I needed to expand our reach. Now, through creative writing workshops online and community, Storymakers shows young writers of all genders the way to their talents and artistic intuition. I’m so glad you've found Storymakers. I can't wait to be a part of your writing journey. I've always known I wanted to tell stories. After earning a journalism degree and working at several Canadian newspapers, I got a case of itchy feet and lived and taught in Bangkok for a few years. After returning to Canada and newsrooms, the recession struck, so I turned lemons into London and earned an MA in Creative Writing (Narrative non-fiction) at City University London, UK. My stories have appeared in publications around the world, including The New York Times. 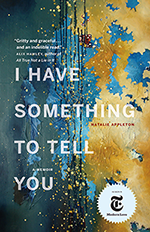 I recently won Prairie Fire’s Banff Centre Bliss Carman Poetry Award, my prose has been longlisted for the CBC Creative Non-fiction prize, and I am the author of the literary memoir I Have Something to Tell You (2018).